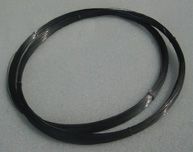 Tungsten wires can be used for producing electric light source parts and electric vacuum components, heating elements and refractory parts in high temperature furnaces, heating elements used in vacuum metalizing or plating. Stanford Advanced Materials can also supply all kinds of tungsten evaporation boats and coils for vacuum metalizing according to customers' requests. Battery, chemical, mine, hydrogen making, acid making, basic industry.